Right up there with the thrill I get from live performance is the immeasurable joy I receive from transferring my skills and knowledge to others! I particularly enjoy mentoringyoung teachers just starting their own private studios, or more experienced teachers who are interested in my techniques. Your voice can be used in many ways, and if it is trained properly, it will last a lifetime. Healthy vocal production is the key. Once you learn that, any style of music can be done successfully and safely. For singing lessons, I accept students from age 9 up. If all of the world is a stage, then, as Shakespeare said, we are all actors (presenters of thought or ideas). Effective use of your voice and breathing is a major part of public speaking, teaching, and acting. I also teach speech structure, preparation, and presentation. If you are already trained vocally, but you have some concerns about your vocal production, a one-visit analysis of what you are doing right and/or wrong at this time might be a solution. Sometimes hearing the same information in a different way helps. 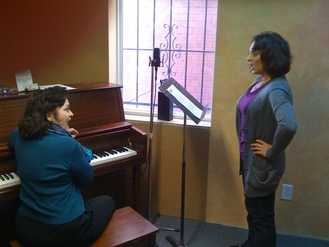 Piano lessons are also available to my voice students, only. I taught piano for fifteen years before demand for vocal teaching prevailed. However, I do believe that vocal students can benefit greatly from piano lessons, as learning to read music and rhythm in an external way is easier than not. I offer on-site lessonsin Chandler, Arizona, in the East Valley of Phoenix, and I offer Skype or FaceTime lessons anywhere in the world! Check out the drop-down menu for more information.